Today was another miserable rainy morning and although I had grand intentions of wearing a skirt with this top today, I just couldn’t do it. 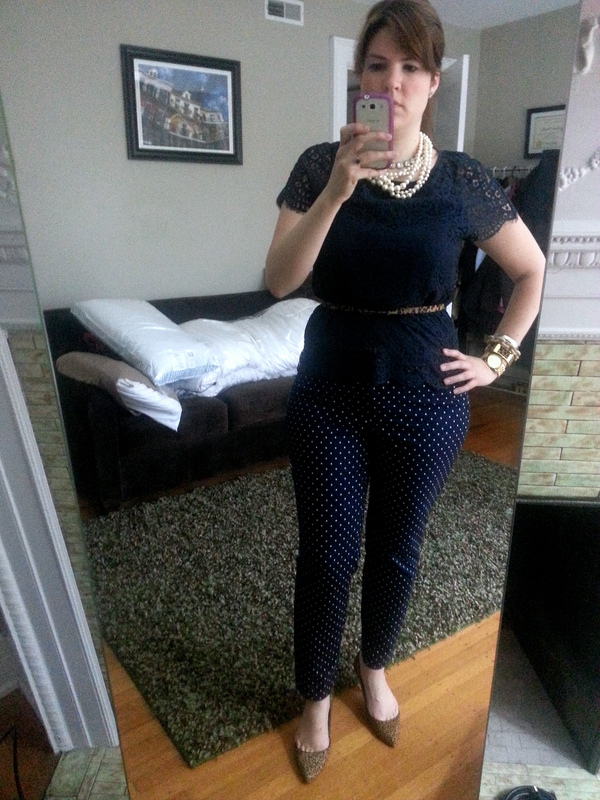 And since pajamas aren’t acceptable in the office, I settled for some J.Crew cotton polka-dot cafe capris. Part of me wanted to sport all black in protest of the weather, but I can’t currently find my favorite black sweater (UGH) so navy it was. I stayed with my tried and true pearl/crystal necklace combo after I failed again to style the J.Crew factory neon crystal necklace in a way I was happy with. I’m still trying. This morning’s photo took a lot of extra light since there was literally none to be had – it was that dreary out. P.S. – I’m excited to say that I linked up today with Mix & Match Fashion Blog for What I Wore To Work! Love that top!!! Yes worth the extra effort! I have that top and never thought to belt it – great idea! You outfit is wonderful. I usually polyvore an outfit the night before and 50% of the time when I dress, I pick something totally different. At least I had a plan. I admire bloggers for posting their outfits regularly – so much pressure! Cute. I like the necklace combo and shoes, especially.